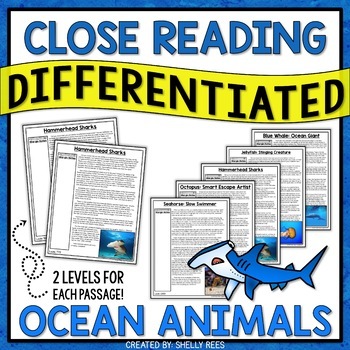 This Ocean Animals Reading Packet has everything you need for a complete Close Reading unit in your classroom. Students will love the passages about Blue Whales, Seahorses, Hammerhead Sharks, Jellyfish, and the Octopus. 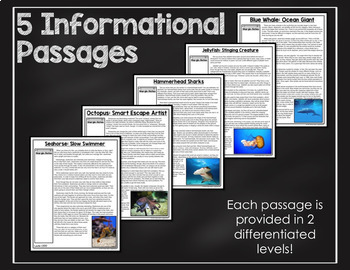 Differentiated Reading Passages are at the heart of this one-stop resource! By purchasing this bundle, you are saving 30% off the price of the individual packets. Please see the PREVIEW above for an idea of everything included! If you have never used Close Reading or even if you are already a pro, this 62-page packet truly is for you! It has everything you need for a complete, successful informational text reading unit. Each of the 5 passages included in this resource is provided in two differentiated reading levels. One is in the fifth-sixth grade reading range, and the other is in the third-fourth grade reading level range. The reading level is given for each passage, along with a guide that provides specific readability levels. 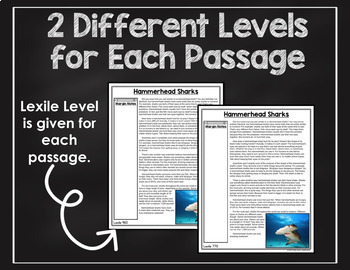 I've taken all the guesswork out of differentiating and leveling of passages for you! This packet is both rigorous and Common-Core aligned. Questions have been carefully crafted to move readers from basic, recall questions to higher-level questions where students must cite evidence from the text to support their answers. There are 5 tasks/activities for each passage, moving from easier tasks to more challenging activities. 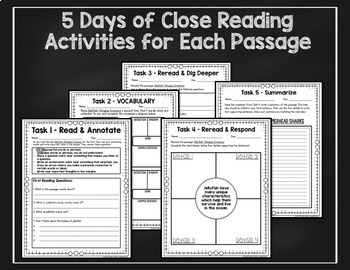 Each passage and its corresponding activities offer a full-week's worth of close reading.